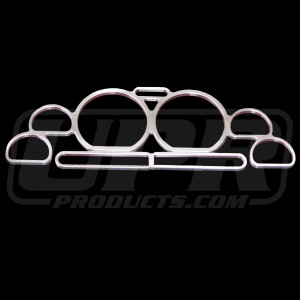 Get UPR's new Billet Gauge Bezel made from T-6061 .200" Thick Billet Aluminum for the superior quality and great looks. This gauge bezel when installed in your cars gauge cluster will give it the ultimate classy / show car look while being subtle enough to appeal to everyone. Crafted to fit around the factory gauges. Installs in approximately 45 minutes with silicone adhesive (not included). 1994 1995 1996 1997 1998 1999 2000 2001 2002 2003 2004 LX GT GTS V8 V6 Mustang Cobra Shelby Roush Saleen & Steeda Vehicles. No one else can stack up to the bold clean styling of our aftermarket Billet dress ups, Street Strip & Racing Suspension & Performance Parts for your late model American Muscle Car!